A new event added to the history of India. 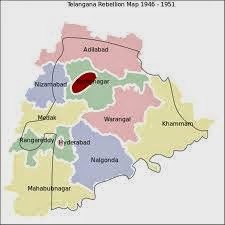 After years of appeals Telangana was declared as new state of the country. Vaikundarajan states that K Chandrashekhar Rao, the chief of Telangana Rashtra Samiti who was the first to initiate the moment will be the first chief minister of the state. The demand for the separate Telegue state was there present in the minds of the people. After decades the voice of the people were heard and with new government emerging the state too emerged. Due to various issues faced by the then Congress government had merged Andhra with the Telegue speaking areas for their political interests. With the linguistic basis of states the language is being assumed as the pointer of a homogeneous culture of the state might get challenged added Vaikundarajan. There are several preparation are going under way to officially announce the 29th state of the country. The chief minister K Chandrashekhar Rao promises a bright future for the people of the state both in rural and urban areas.